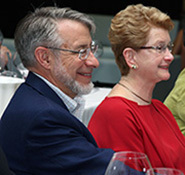 The Donald and Victoria Hess Endowed Memorial Fund was established to benefit the Hauptman-Woodward Institute and to honor the longtime contributions of Don and Vicky Hess. The fund was eastablished by Chuck and Nancy Dowdell, Chuck was Don’s longtime business partner and good friend. The goal of the Donald and Victoria Hess Endowment fund is to raise permanent funds to further secure the financial strength of Hauptman-Woodward Medical Research Institute. Don, a native of Rochester, New York, graduated with an Engineering degree from the Massachusetts Institute of Technology. Chuck and Don co-founded Amherst Systems Inc. in 1975 and became business partners and life-long friends. After his retirement from Amherst Systems Inc., Don donated many hours of technical support in HWI’s crystallography laboratory. He then joined HWI as a board member in 2000 and, beginning in May 2005, served as Chairman of the Board until his passing. Hannelore Victoria Hess, known to her friends as Vicky, was born in Munich, Germany. She moved to the United States to pursue studies in English. She received both her bachelor’s degree and her master’s degree in Linguistics from the State University of New York at Buffalo. An avid world traveler, she enjoyed skiing and hiking, and was an enthusiastic collector of contemporary art and furniture. Vicky served as a member of the Brookfield Country Club, the Twentieth Century Club, the Clarence Contemporary Club, UB World Connect and the Buffalo Schwaben Choir. HWI invests the earnings from the Donald and Victoria Hess Endowment Fund in basic research and in the search for cures to a variety of diseases. The support will focus mainly on new scientist hires. Throughout the next decade, HWI intends to hire scientists who will bring innovative ideas and new areas of expertise to our renowned faculty. The Scientific Chair Program is designed to maximize the productivity of HWI scientists and to improve their position when they compete for research grants. Specifically the program will support original research projects or extensions of existing ones, provide matching funds for grant requests, and enable HWI to purchase needed laboratory equipment. For more detailed information on how you can contribute to this fund contact Dr. Sarah Smith at 716.898.8636 or email ssmith@hwi.buffalo.edu.